How would you like to own, at an incredible bargain, ten books that readers like yourself have already voted to be the best examples of speculative fiction published in Canada? Well, here's your chance. I'm once again curating an ebook bundle for StoryBundle.com of winners and finalists for Canada's premier speculative fiction award, the Aurora Award. The Auroras are awarded annually by the Canadian Science Fiction & Fantasy Association (CSFFA) for excellence in Science Fiction and Fantasy. Introduced in 1980 as the Casper, it was renamed the Aurora Award in 1990. I'm honored to have won the Aurora three times and to have been on the final ballot another sixteen. 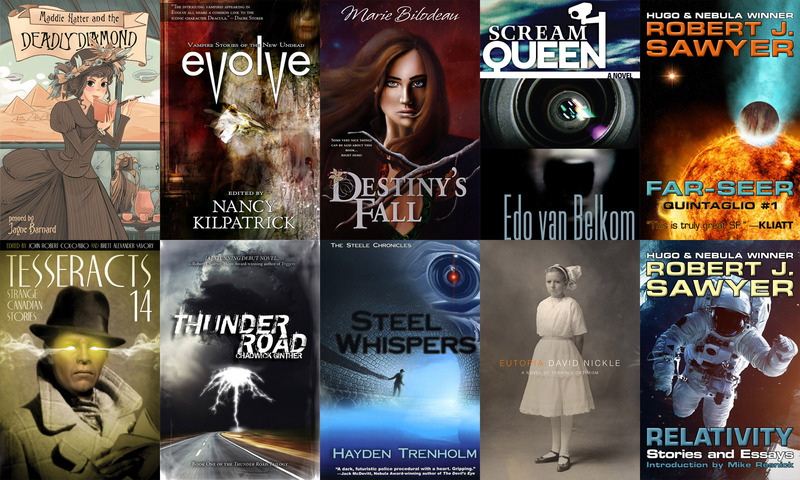 This Aurora bundle again delivers a great mix of speculative fiction genres: SF, fantasy, urban fantasy, horror, steam punk, as well as young adult. The titles reflect the long history of the Auroras, spanning nearly a quarter century of Canadian speculative fiction from 1993 to 2016. This bundle also provides a great introduction to several wonderful series, including the first title in three separate series and the second book in two more (which can be read as stand-alone titles). And the bundle lets you sample the rich tradition of Canadian short speculative fiction, with two acclaimed anthologies and a collection. The bundle allows easy reading on computers, smartphones, and tablets as well as Kindle and other ereaders via file transfer, email, and other methods. You get multiple DRM-free formats (.epub and .mobi) for all books! Check out the bundle here for more information and details on each of the included titles. And remember, it's available for a very limited time only, from today until November 30 at midnight.